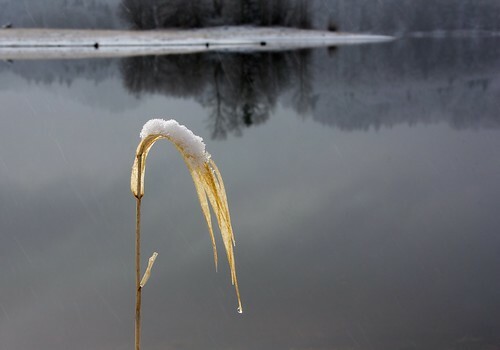 The slow drip of spring, a photo by The Bacher Family on Flickr. 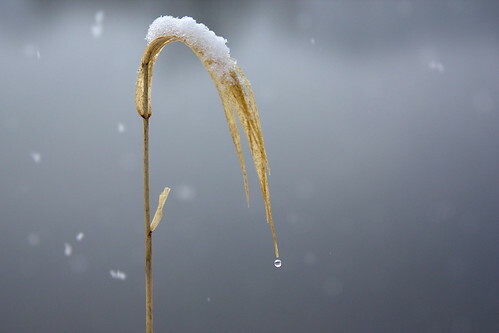 This time of year, even as the snow falls, the sun comes out between the clouds and sparkles on a drop of water dripping from last night's accumulation on a blade of dry grass. Capturing it all was a fun challenge that required a lot of patience, waiting for just the right combination of light and focus at the precise moment when the drop of water was full but hadn't yet dripped off the end of the leaf. Once it had, it was another couple of minutes before the drop formed again and I could make another attempt. 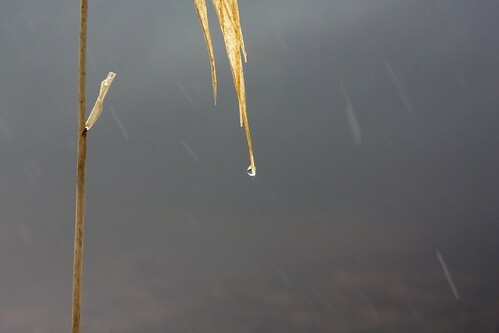 I even caught the drip in the middle of falling, twice, though the high shutter speed required to catch it made such a wide aperture necessary that it was difficult to keep all the elements of the photo in focus. In the end, this is my favorite of the set, with that transcendant light shining through the translucent leaf and refracting through the drop of water at its tip.